Sometimes on my tutorial posts I'll get a sweet comment that goes something like, "You make me sick. Don't ANY of your projects turn out less than perfect?!?" The answer, of course, is a hearty "BWAHAHAHA!!!" Which is to say yes. Ohhhh yes. That said, I believe that failure is really only failure when you give up. 'Til then, it's just a work-in-progress. Uh, I have a LOT of works-in-progress, guys. So today, I want to share one with you. This is not a tutorial, because I haven't worked all the kinks out yet. However, I'm almost there, and I think you guys might be able to give me some advice/suggestions, while hopefully still getting some fun DIY inspiration out of it. Because every other book purse is essentially a gutted book with handles on it, they have to be made from relatively fat books. The problem? Fat book covers are BORING. (Encyclopedias, anyone?) And if you use regular sized books, like a Nancy Drew, then your purse has a maximum girth of maybe two inches - not very practical. The prettiest cover options (in my opinion) are kids' books, but those are the skinniest of them all. With my solution, the plastic is holding the entire weight of whatever you put in your purse, so it's important that you have a lot of plastic overlap glued to each book side. For the handle I used a recycled chain belt, which looks pretty, but is heavy and rather clanky when you put the purse down. You can also see my pocket goof. Heh. Sewing skills have always eluded me (most of this was done using hem tape), but I thought I'd be clever and add a pocket to the lining. It wasn't until I glued the lining down that I realized the fabric wouldn't be able to flex, so the pocket was useless. Oops. After figuring out the spine, my next challenge was the fabric edges on the side, which need to expand when the purse opens. I considered elastic, but I've yet to find a glue strong enough to handle that kind of strain. I also used the clear plastic in the fold over strap with the magnetic snap on it, for strength - but you could also use interfacing. These also help preserve bumped and peeling corners. See that line of stitches along the edge of the fabric there? That edge remains one of my biggest hurdles: I need a way to attach the fabric to the book cover that won't lift over time. Because it's on a crease, all of my glues eventually give out, so I thought I'd try stitching. This had to be done by hand, through the layers of plastic, fabric, and paper board, and was a huge pain. You guys have any other suggestions? With the body of the book purse mostly figured out, I next set about finding the perfect book purse handles. ...but they just aren't practical. If I can't comfortably carry it on my arm or my shoulder, it's not leaving the house with me. Here you can see the fabric lining lifting on the inner corners and around the fold over clasp. Again, I've yet to find a glue that will hold long-term (I've used this purse a few times over the past few years), and I'm loathe to put rivets or grommets through the actual cover. I should go back and take that chain off, and just use the leather handles. Which, by the way, are super easy to make: just cut a thrift store belt in half, thread the ends through metal rings, and hammer in a rivet to hold them shut. Beats paying $6 for store-bought ones, right? Apparently the flexing makes it more manly. 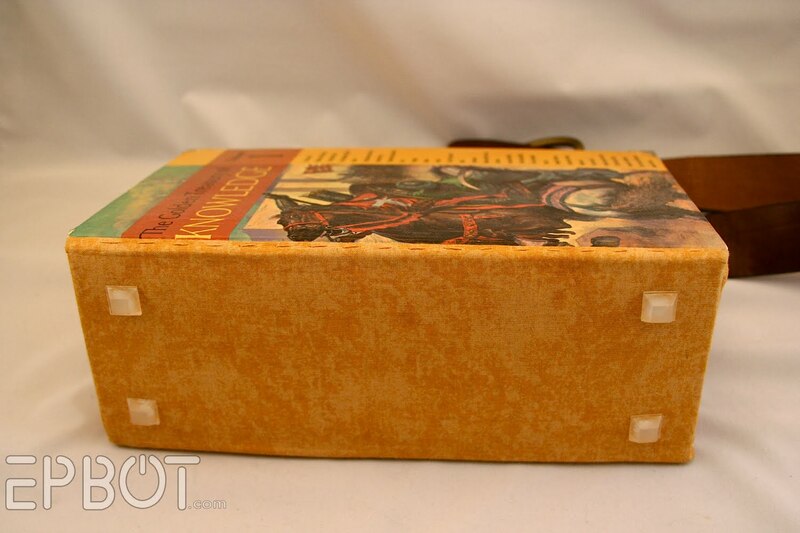 1) Is there some miracle glue out there that can permanently hold fabric to book covers? 2) In the same vein, do you have any suggestions for stitching/riveting through the covers? 3) Can you think of any way to make a book purse actually close, so that your things won't fall out when it tips over? I've debated attaching a zipper or even a metal snap clasp to either side, keeping the fabric edges free, but I'm again stuck on how to attach something to the book edges. I suppose the alternative would be to build a zippered bag separate from the book and then attach it inside, but I'm not sure how that would work, exactly. Frankly, any suggestions/advice you guys might have would be welcome. I've poured more hours than I'd care to count into these, and I'd love to make more - but not until I perfect the design further. It looks like you're using a good fabric lining. Have you tried leaving some excess fabric at the top and putting the zipper there? So long as the lining is attached to everything else well enough (sorry no suggestions for that at the moment!) a zippered lining should be enough to keep the bag closed. Have you looked at book repair supplies? Gaylord is one such supplier, see http://www.gaylord.com/listing.asp?H=7&PCI=128355 Maybe the glues and tapes meant for library books would also work well for your purses. I couldn't get the sides even - they were even when I cut the fabric, but trying to glue down that second side inside of the book was just too much for me. I have no patience, and no coordination. What about making a purse to the dimensions you need for the given book, with open sides with lipped edges to just slide the covers down into? Then a zipper would be easier and good glue would no longer be a problem. Of course this would mean sewing, so maybe not an option? 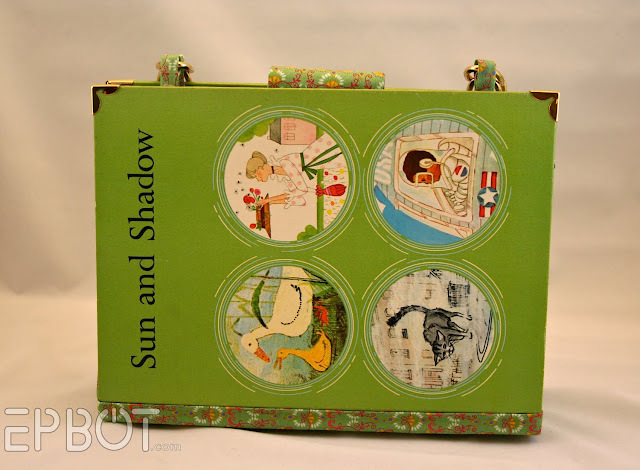 Best Book Purse thoughts - what if you constructed a fabric or even a leather purse pouch - but framed a hole on the front & back for the book covers to be displayed through? Then you could have funky design with optimum closure, protection of cover & utility of the purse? 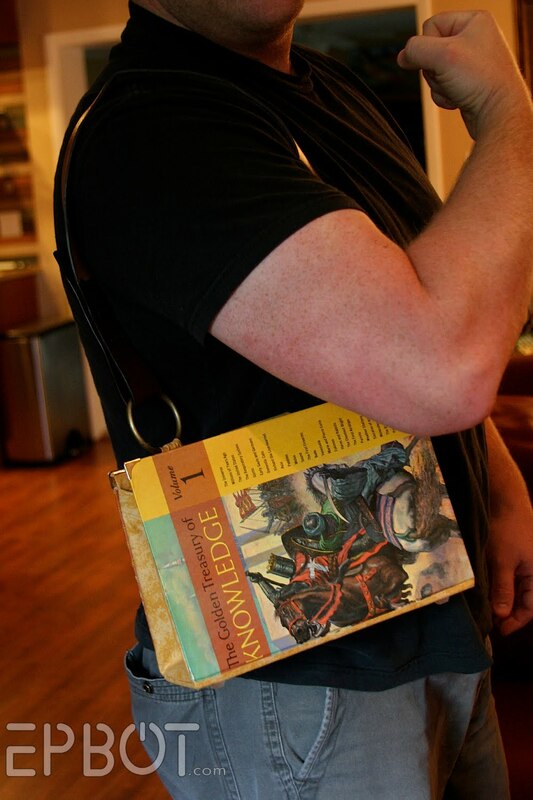 My favorite handles are the leather belt on the knowledge book - I think that perfectly compliments the cover. Also - I like the grommets on the science book but agree the chain doesn't work. Hope this helps spark a new idea for you. Also you could post a new craft/diy/ idea daily & it wouldn't be enough for me - so thanks for the great inspiration & keep it going! Also, I had never read of book purses. I need one in my life. Make the fabric bag with zipper and attach to the book binding with old fashioned rivets OR sewing it on with a leather stitch. (you'll have to drill holes first and look up leather stitching with 2 needles but hey, I'm so helpful) HAHA great effort! Try a fabric handle like a tote bag. I'm not sure any glue will hold up well unassisted, especially if you're making purses-big-enough-to-put-stuff-in. A stitching awl would make sewing through book covers a lot easier, and some combination of stitching and gluing will probably work. Plus then you can do the stitching in contrasty thread! Love your blog. I took a course when I was younger in purse making. This was 15 years ago if my memory is right. We use contact glue or a special glue for shoes making to glue leather on card bord. Try that its sould work. And totaly great idea bibliholic29 excess fabric will give you what you need for a zipper. 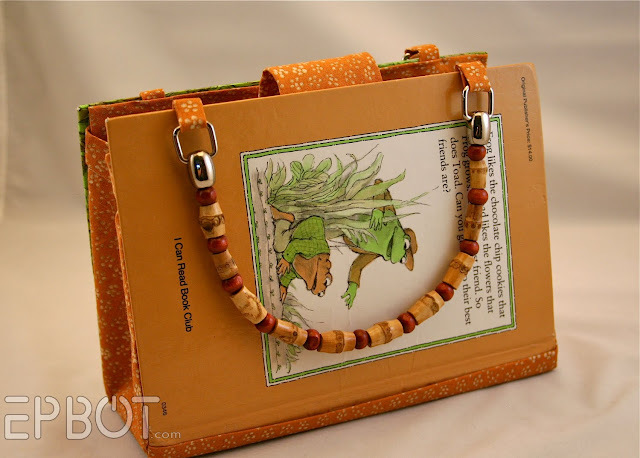 Who says a book purse actually needs to be made out of a book? To solve your stiching/gluing/attachment issues, you could simply scan the front and back covers of your chosen book and then print them onto fabric. I've seen this paper-backed fabric you can run through your home printer, but can't remember where now. If you can't find it or need a better image result I'm sure a professional copy place could do this. Once your image is on your fabric, simply sew away! You could insert cardboard or other such material inside to stiffen it up and give it the look of a real hardback book. You could try a magnetic clasp to keep the purse closed- it would likely be easier than a zipper, and less wear on the book covers than snapping open and shut. I'll have to admit that I haven't tried using this material at all yet -- but I know the fabric stores have a clear sew-able plastic. Usually kept near the waterproof picnic table covers, I think. Perhaps instead of trying to make the book cover withstand more than it was ever meant to you could build a framework around the cover with the clear plastic outside pocket to hold the book? My favorite "does everything" glue is E-6000. That stuff REALLY WORKS. Ooh! What a neat idea. I wonder if you could use a small metal crimp of sorts along the edges of the book. It would look like a thin metal frame and its teeth would hold the cardboard and fabric together. That may be the worst possible description of a piece of hardware...I honestly don't know what the name of something like that would be. If that didn't work, a row of small tacks similar to an upholstery tack might look nice. You could try drilling tiny holes, or making holes with an awl, before you stitch through the fabric/plastic/book board. PS--I have a couple of my box purses up here and here. I often either cover them in fabric or pretty paper, then use a water based clear coat to protect them. I glue the decorations on with E-6000. The only problem with using book repair supplies is that one of the foundation principles of book repair is that the repair must be weaker than the book. If the repair is too strong, the book will simply break again around the repair. As such, the repair materials are generally not strong enough to survive the wear and tear of a purse. I think your best option is contact adhesive, rivets or a similar hardware, or sewing with a thick waxed thread (maybe in a contrasting color?) You can always use a fine-point awl to pre-drill the holes in the covers. I do love your choice of children's books! Whoa. Check out the gun show! For your glue issue, E6000 is the miracle craft glue, I kid you not. without going into why, I've had to glue about 200 rhinestones onto a sweatshirt, and that thing has been washed more times than I can count, and they are all still holding on strong. A friend of mine used it to glue molding around the exterior of her doorway and they haven't come down yet. As for closures, I would say a zipper would be your best bet if you have enough fabric on the tops to make one. Another option that popped into my head is to sew clear vinyl pockets on the side to instert the book covers into (like a window) and that would keep the bookcovers clean and resist some water. Love your craft tutorials!!! Keep up the good work! 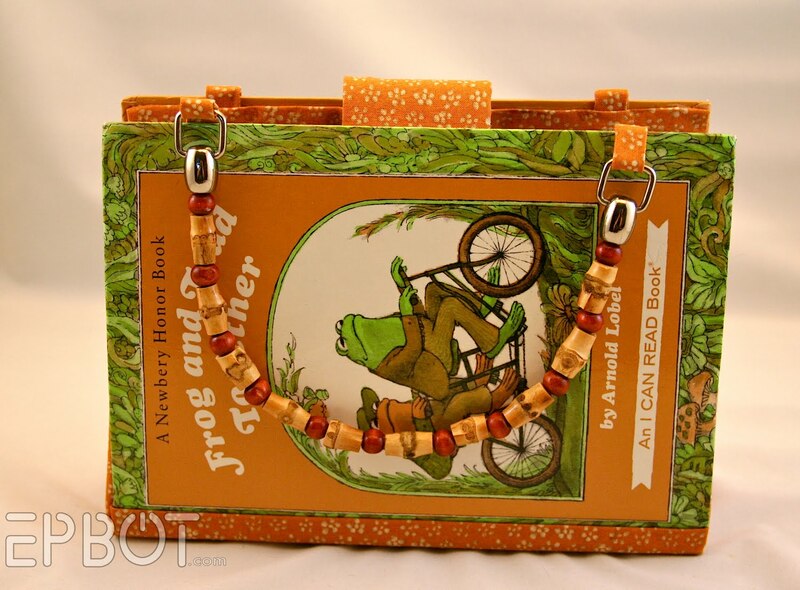 Love your bags, the Frog and Toad is my favorite. Sorry if this is a repeat suggestion(I didn't have time to read all the comments)I saw this purse once that had a lining that came out and it was actually snapped into the purse shell; you could move it to any different purse with the snaps. Good luck and I love seeing your projects! Oh boy, these are amazing, I'd so buy one from you, they seem to be of superb quality! This gives me an idea. I need a big old Bible...! First of all, I just want to say I love this idea. I've never seen book purses before, and they are SO CUTE! I had a thought for the pocket- try putting a couple pleats in the bottom to make it stick out. For the zipper, you could sew a zipper to an extra strip of fabric to the lining, so it kind of sticks out when you glue the lining down. I definitely have to try this. It is so awesome! I did have some thoughts on how to attach a single strap. How about attaching the 4 d-rings as if you were gong to clip on two handles. So two on the front, two on the back. Then attach one end of the strap to the left front ring, thread it away through the left back ring and back through the right back ring. Then attach to the right front ring. When it's over your shoulder, the strap pulls it closed. When you take the weight off the strap, it can run through the rings to open. It would need to be a fairly thin strap though. For the corner stitching, have you considered some type of brad? you could hammer them through and then cover the backs with more fabric. also, it would give it the look of those old smoking chairs. 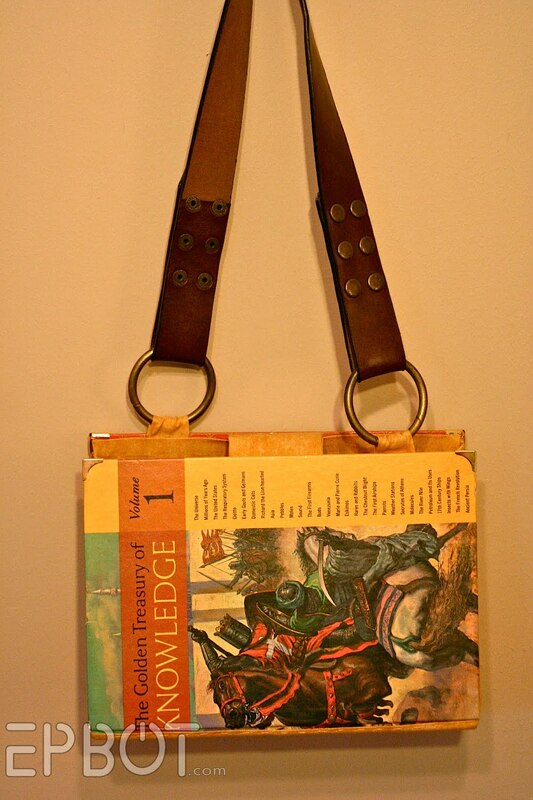 That way you could use an old chemistry text book and make a steampunk book purse. I agree with the Crop-a-Dile. It's fab for DIY stuff. That will punch through anything and set eyelets. Am I to assume high-temp hot glue has been tried and failed? I remember that working well on many of my various craft projects over the years, and they've held up to quite a lot of torture. As far as the fabric edge on the bottom goes, can you glue the fabric to the inside of the book cover (using above hot glue method), then do your plastic/masonite/fabric on top? Then you just have to make sure you cut the spine off the book neatly, but I think that would be easier than trying to get that fabric to stick to the outside. For the closure, I think magnet strips hidden inside the lining would be a good alternative to a zipper. If you wanted you could make a separate casing at the top of the lining to accommodate the strips. Also, for one strap, is it possible to put grommets in the side panels? You already have the plastic in there so it should help carry the weight. I've seen them on a small mischi purse (the ones with the replaceable outside covers) and it seemed to work well. Hmm, I think biblioholic29 has the best idea about using excess lining fabric to edge a zipper. Of course, you'd have to double the fabric so the wrong side wouldn't show, kind of like a larger version of the flap you've got... anyway, you'll have already figured all that out. What I really wanted to say is: "Oh, please, please, please, can you make a big tote-like one out of a coffee table book, to be used to... carry library books?!" For flexible spines and such we used those white mailing envelopes that are made of some indestructible yet thin and foldable plastic. We used heavy gel medium for adhesive because it is flexible. I'll have to think about other possibilities for a project like this, but I think you are on the right track. Keep up the good work! 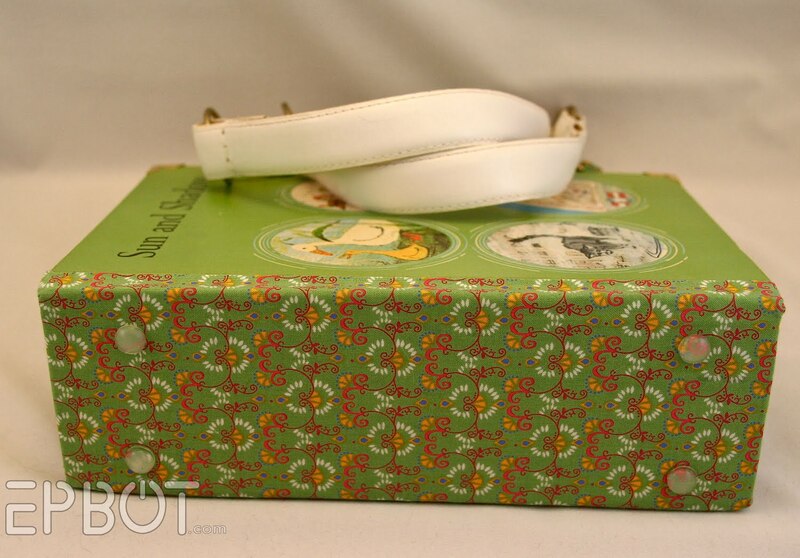 I've not done anything like this, but what if you made something that looked like a modified vintage book strap, like this? You could figure out a way to cinch it closed, too? Sounds like you need to try "barge" - it is industrial rubber cement that can buy it at most shoe repair places. I have used it in almost every film world costume shop I have ever worked in, including a mascot place. Toxic but totally amazing stuff! Have you considered finding an old purse (or even a new one) that fits the book cover? You could just glue the covers to the purse and add a spine? That seems like the easiest thing-- and you could come away with a purse with pockets and sections and all sorts of purse contraptions rather than the classic "black hole" design. :) That would be my suggestion for a non-sewer. My first thought was to make it like a miche bag.....not sure if you could do that or if you would like that. 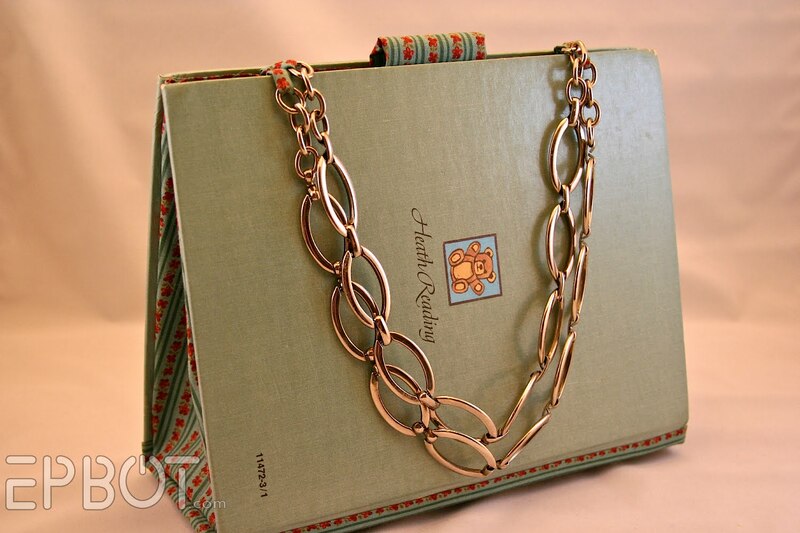 Make the inside of the purse with light weight but sturdy materials (with magnets embedded) and the handle you love. Then create the book cover portion with fabric (with magnets embedded). Then you could switch out book covers and only have 1 or 2 different inner shells. The only downside I can see is that it might be heavier than doing just the book purse alone and books come in all different shapes and sizes (this could be fixed by attaching fabric around the perimeter of the book or shaving the book cover down). Maybe you could put a pleat in the pocket so it will open...maybe? Adhesive Suggestion: E3000. I haven't used it personally, but it's on my list of things to pick up at the craft store. I like the making a purse with openings on either side to slip in the book covers idea - several people suggested that (and way before I could get my typing going). For the closure issue on the ones you've already made, do a flap like the one you have for the magnetic snap but do a long magnetic strip on the inside cover and a fabric covered long magnetic strip on the flap and you'd have nearly full closure if your flap is the same size as the sides of the purse. Sorry if that doesn't describe it well. And fabric handles would be good - if the single strap isn't to your liking, braid several strands of the fabric in a long line and attach each end and have a braided strap. You can also get your chain ones to be less clanky but still pretty by threading fabric through the chain link holes from one end to the other (and to make it more stable, maybe one strip of fabric on one side and one on the other and a small sew/tacking in the middle of the chain link hole). You do such fun things! 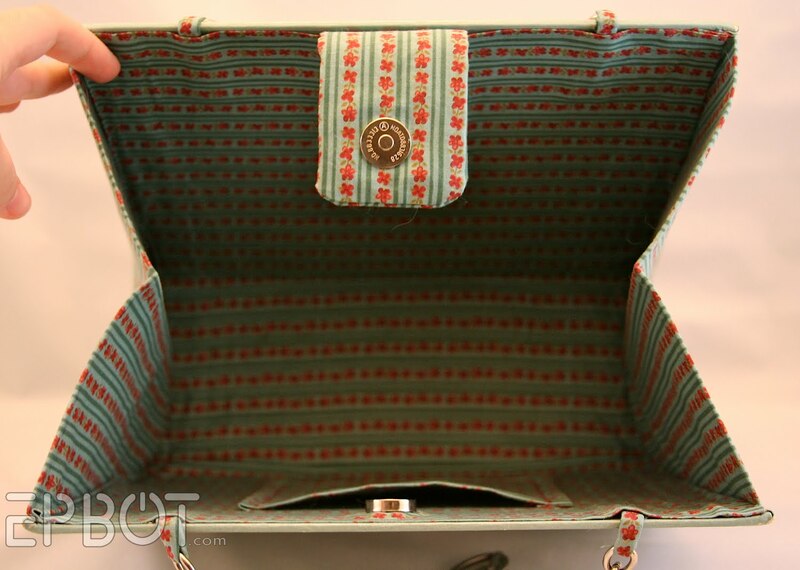 I would try sewing the purse on a sturdy sewing machine (I use an antique Singer, and it'll sew through ANYTHING) with a leather needle on the longest stitch length. You might also look into a grommet punch/press set. Look for one with a handle leaver, not one that requires a hammer. Well, it seems everyone had the same ideas I was going to post! :) Not like I had many, but I did have the ribbon in the chain idea. But do invest in some E6000--I used it to glue rhinestones to some metal rosettes for my bridle, and it has stood up to the heat of Arizona with no problems. I love that stuff! I apply it with a toothpick because a little goes a long way. You can get it at any craft store and I've gotten it at Target and Walmart before. Ironically, my WV word is "decoro." okay, I apologize in advance if this has been mentioned a lot of times previously - not awake enough to read over the 43 comments viewable right now. Here's where I found out about it. don't give up on the pockets... I cannot function in a purse without pockets. Instead of just another strip of fabric that has no give, try making a pocket that has it's own dimension. Think the shape of a paper sack, only smaller. Instead of having a wide bottom, just have kind of accordion out. You could even have snaps to keep them closed. If that sounds too complicated (I don't sew), you might try kind of the cellphone case approach. Basically, instead of attaching a strip of fabric directly to the lining, use some elastic strips. It won't be enclosed, but it's good for bigger stuff, like a cellphone (obviously). I don't actually crochet - but could you perforate the edges and then crochet the book front and back to the body of the purse? It might be helpful to try something like gluing the book to an empty photo album or other binder and remove the ring apparatus. How that in turn would work with fabric I don't know, but it could solve some size issues, maybe even stability ones. I would like to see the purse made so that the covers are facing up how they are meant to be viewed, to really show off the illusration and cover design. If you make the purse first, then use the metal corners to protect all corners, and use epoxy to attach some sort of hardware (bra extenders, for example or even SNAPS for interchangable covers!) that you can then sew onto the fabric purse sides I think it would be secure! Is there a way to use the spine as part of a single strap handle? Maybe studding it onto a leather strap? Taking a page from laptop bags, you could kill two birds with one stone. Instead of making the bottom of the bag out of the spine (or replacing the spine), you could make a more traditional cloth-type bag that used both sides of the book as one contiguous side with a flap-type cover (use magnets or velcro to keep the flap closed to the non-book side of the purse). Probably has been suggested, but E6000 has been the greatest adhesive I have used. I use it always in place of "Super-Glue" and never had to re-glue a thing. Good luck! the best glue (i.e., the best holding glue) that I have ever used for paper/fabric work is Crafter's Ultimate Pick by Beacon Industries. Works every time on porous surfaces. I'm thinking a kid's book cover Kindle/eReader cover would be awesome...Anyone else? This is wonderful! I think I now have a suggestion for our FOL for what we can do with all the old World Books people donate. Please post a followup if you get it to work! Jen, the first thing I thought of was creating a more versatile bag where you could change the cover. Here is a link to a company that sells their bags in Canadian Costco stores - to give you an idea. It's all attached magnetically. I am not crafty. Or girly. I may own a purse, but if I do I have no clue where it is. I do know magnets, though, and I think a few neodymium magnets would solve your closure problem. You could glue or epoxy them inside the fabric so they wouldn't show. That would keep that purse shut no matter what! However, they may be too strong for you to open the purse easily. It's worth a shot, though! I have a couple of ideas that might help. Hopefully I'm not repeating something for the dozenth time :). Idea the first, you could get some cardboard and make a book shape with covers that match the ones you have and the width that you want. Add the lining to that and cover the bottom with fabric. Since you'll be covering it later, overlap won't be a problem at all; just use however much it takes to stick well. Once you've got the bottom and sides done, just glue the covers to the outside. It won't be weight bearing, but might still pull out over time. However, since it won't be structural, regluing pulled bits would be much simpler. The other idea is really pretty similar, just changes the order of things a bit. Cut your book-sized piece of cardboard and glue the covers directly to that. You'll have a sufficiently wide spine, but your spine and covers will be all one piece instead of having to take all the weight on that edge. One final thing that I picked up in a sewing class once. A good way to create a sturdy, relatively stiff, but still flexible surface is to layer plastic canvas between cereal box cardboard and then cover it. So maybe you could cut a cereal box to size and then add some plastic canvas and another layer of cardboard inside the spine part for reinforcement without adding weight to the whole thing. I have no ideas for the handles. For gluing fabric to anything, my favorite glue is Sobo. It's in many ways like Aleene's Tacky, but it seems to hold better. It's a key weapon in my crafty arsenal as it's good with polymer clay, plastics, wood, fabric, paper, and combinations thereof. confession: I've made lots and LOTS of book purses, and I think I might maybe have a picture of one somewhere, but no good in-progress shots. As far as the fabric/book attachment, go look up a local craft center and try to find a book binding class -- I attach my new "spines" (aka bottom of the purse) with some of those same stitches, it means it is strong (be sure to use deep-sea fishing line, the stuff is amazing). For the sides of the purse and the top (that CLOSES - I'm always impressed when it works), I take the pages of the book that I've gutted that I really like, lay them out, and then sew them into a pocket of some sturdy flexible plastic, I find that clear shower curtains work well. If you sew vertical strips, you can make accordion-style sides. With the PAGES of the book. As far as the top goes, I design mine a la LLBean canvas bags that close with a zipper (you'll have to google them to see what I mean). It is quite broad, so you don't have to close the book all the way, and, since you're sewing everything into plastic, you may as well sew in a zipper, too, right? Finally, I always attach my handles (think about using covered book bindings or heavy-duty canvas ribbon) through the books themselves. I'm not a huge grommet fan - it never really seems to go with the book covers I have - so I simply drill through the book cover (the same method can be used to attach the bottom - again, go learn bookbinding! ), reinforce with hardening glue, and string the handles through. 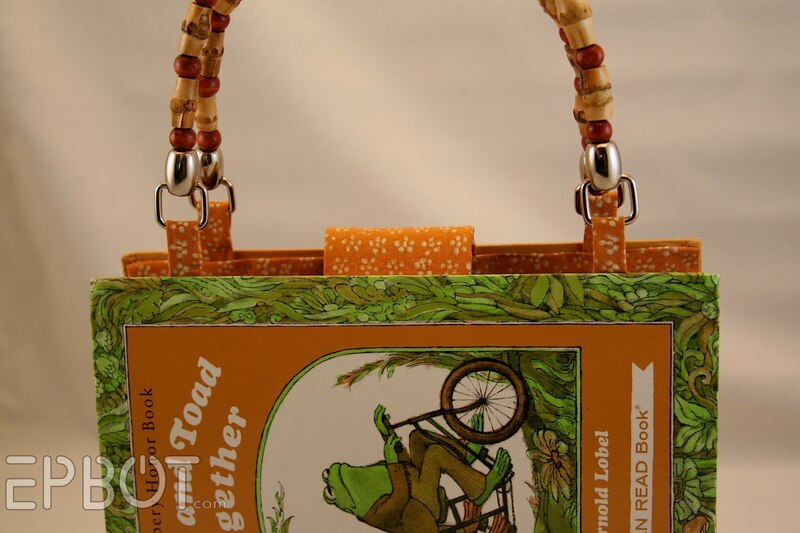 The other alternative is to essentially make a bag within the book, so that the book is just on the outside. In that case, I'd string a canvas ribbon through my slit in the book, and then UNDER the "bag within the book" -- this way, the wear and tear of picking up and putting down is on the fabric bag lining the book itself so the whole project is more functional (and waayy less delicate). Could you make a neutral zippered bag that would stay in your purse with either velcro or magnets? You could just move the zipper bag from purse to purse, and it would all stay inside if the purse tipped over. Have you tried this glue? Just another option to consider. Also thinking maybe bookbinding tape would be an alternative to the plastic for attaching the spines. It's flexible, yet strong. I used it when I was experimenting on designs for coupon organizers. You can get it at Hobby Lobby. Investigate the leatherworking aisle of Hobby Lobby as well. There might be some tools that would help with the stitching and riveting. 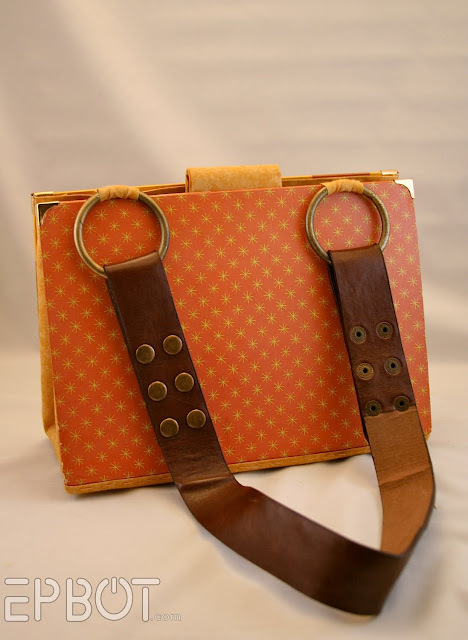 I'd also suggest metal grommets in the fabric sides of the purse that you could use to attach a handle. (Hobby Lobby sewing section I think). Yeah, I shop at Hobby Lobby a lot. I love these purses. If I wasn't such a freak about having compartments in my purse, I'd carry one of these for sure. I recently purchased "FABRIC STIK" fabric glue sticks for the hot glue gun! (@Hobby Lobby) I admit - I have not tried them yet - the bag says - machine washable - stays flexible ... I just had to have them on hand to try them out ... they might be something that would work for you? I think a zipper top would be best for securing the purse contents - I have a vision, but am not sure how to share it with you in words. haha You need an extension of the lining - half the width of the spine - insert between lining and book cover - with zipper attached to the two extensions where they meet in the middle. Does that make sense?? (I can't imagine doing all this without the sewing machine - that's my weapon of choice!). Fabri-tack holds EVERYTHING. Even things you think it won't hold. It's a glue, and it's easy to get at the craft store. Also, my darling son saw the Frog and Toad bag and yelled "FROG AND TOAD!! Wait-why did she turn a book into a bag?" 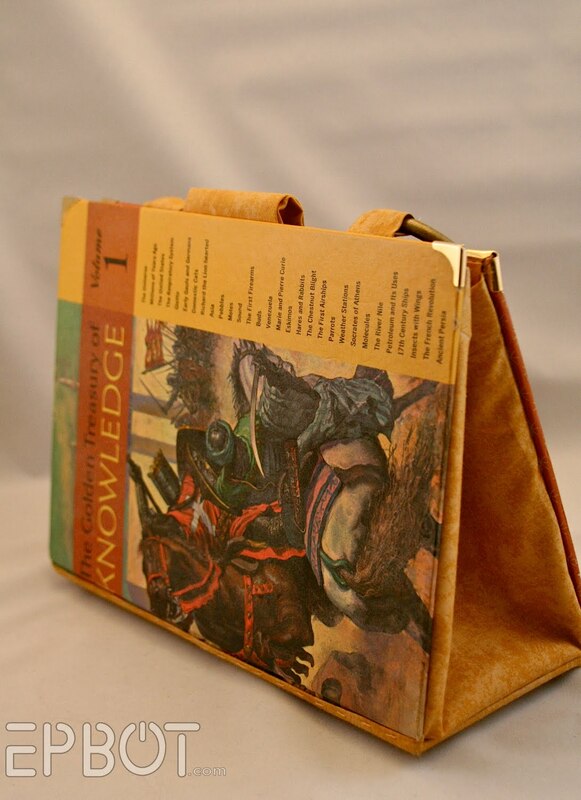 What if you used two books, and flipped one over, so the front cover was actually the flap that closed the purse? You'd need three covers; bottom front and back, and top back (which folds on the spine to make the front flap. These are FAB! Haven't come across the idea before, but I reckon I'll be trying it out! Someone may have said this already, I didn't have time to read through all the comments, but have you tried finding big clunky encyclopedia books with covers and spines the same size as the children's books? Then you could glue the children's book cover to the ugly cover and you wouldn't have to worry about the spine problem at all. Of course finding the right size books might be a little difficult, you could always cut down the ones that are too big though. Hi Jen, I took a book making class in college. To attach the book cloth to the book board, we used PVA glue cut with methyl cellulose. The methyl cellulose made it a little thinner, easier to spread and get a smooth coat. You can get both at http://www.paper-source.com/cgi-bin/paper/howto/methylcell_pva.html, or I'm sure there are other cheaper places online. Stitching might help too. You can get an awl to punch the holes, and then use some nice thick linen thread used for bookbinding. It helps to wax it with some beeswax to prevent fraying. Bookbinding thread comes in a number of colors too, so you could probably find some to match whichever fabric you're using. As far as closure goes, what if you either made the lining for the book bigger, so there were fabric flaps to attach a zipper to? I've never made a book purse, only books. Never had to add a zipper to a book before! As possibly the least crafty person alive, I have no suggestions, but as Frog and Toad's HUGEST fan (my nickname my whole life has been Toad, and I collect Frogs and Toads to the point that my wedding reception had a pond theme) I would probably pay you insane amounts of money for that particular purse! Love CW and Epbot! Continue the awesome work! Single strap solution: put one end on one side of the bag, and the other kiddy-corner from the first end on the other side of the bag. That way, when it's carried, the straps will still act to close the purse like the double-handle option. The length you've opted for should still fall out of the way when the purse is open. So many comments, I couldn't read them all, so apologies if this is redundant. First, tell John I totally get the manliness, because Knowledge is Power! Second, E6000 rocks. You might try a search at OnePrettyThing to see what others have done for adhesives, if you haven't already. Third, a thought on handles. It involves sewing, and I'm sorry, but you can make a small fabric tube and run clear plastic tubing (thing aquarium tubing, altho I think it's cheaper at hardware stores) through it. Has body but is still lightweight, and always a perfect match to your bag. Okay, ignore my single strap option - you already did it that way. I would suggest magnets on the corners for closure. You could get some tiny (but strong) ones that you can sew into the fabric lining that should snap the whole purse shut. 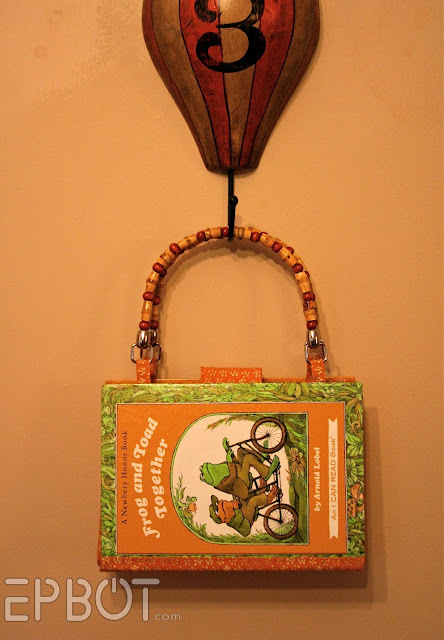 Make the purse, then glue the book covers to it. Using the plastic spine, center it on some fabric, and glue it in. Then, sew the fabric edges (seam to the outside, potentially? ), attach the clasp thing, and the handles. Yes, the fabric will be floppy, but big deal. You'll take care of that in a minute. So what you'll have is a great big floppy fabric purse with a strip of plastic on the outside of the bottom. Take another piece of fabric, and attach it to the two book covers as the spine. Center the fabric over the plastic spine, and sew the fabric spine to the purse. Then, glue the book covers to the outside of the purse. 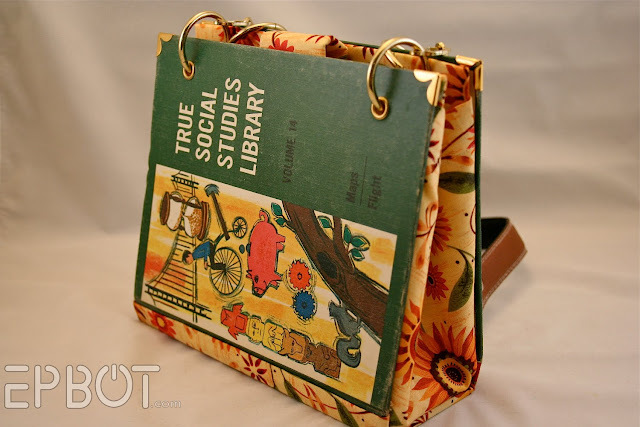 You can then use the brass corners to finish it off, and you should have a perfectly hard-sided book purse, and you didn't have to sew the book covers at all. Plus, it'll have all the durability you need without having to worry about glue coming off. I wonder if my wife would like one of these. I saw an old Mickey Mouse comic book the other day, and now I'm thinking I could cut the covers off, glue them down to fabric-covered cardboard, and make her one for Christmas. That would be cool! Thanks for the idea! I'm glad I read the comments before posting, but I agree that you might get some ideas from the miche bags. I saw these purses, and immediately thought of those! Good luck!! Gorilla Glue is my crafting savior. Be careful though, it takes a while to dry and turns into something similar to cement. Remember your monkey backpack? And how you made a little pouch and turned it inside out and put it in the monkeys to hold your stuff? I could see the same sort of principle working here, basically making it the shape of the book and doing a boxier seam at the bottom, and then leaving some extra fabric to attach the zipper to at top, with enough fabric left over to "loop" over to go back down to be tucked into space between the book and the backside of the fabric - essentially not ending the fabric with the zipper, but making the zipper the part where it would fold back down. This way, you have the zipper sticking out a little which may help alleviate some stress on it and you have covered up the backside of the fabric (because of course we want to see the pretty side when we look down into the purse). The real problem comes when trying to find something to adhere it all together. I do like the look of the grommets and leather (reminds me of pics of the leather strap kids WAY-back-when used to use to hold their books together - before we had backpacks). 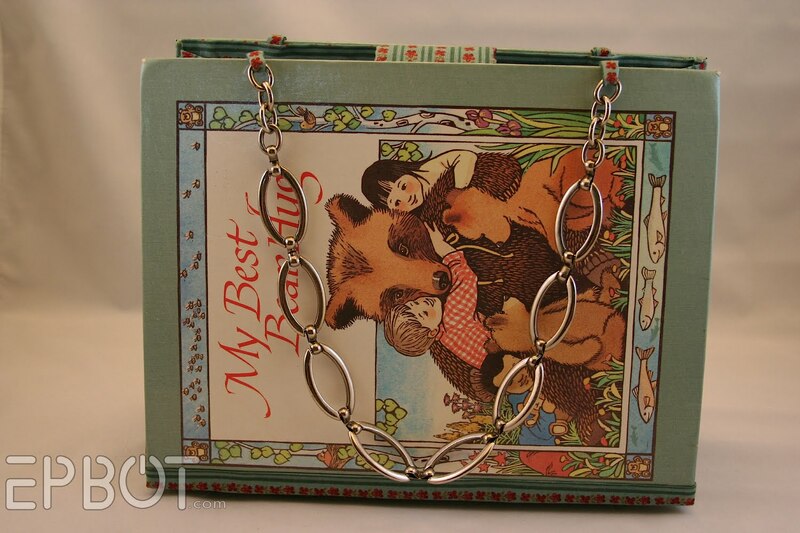 You could also directly attach leather straps using rivets or such to the book cover itself. This would all help hold the fabric in place. It could also be nice to trick out a bag in little brass brads (like you would see on leather furniture) or at least something that would have that look. For closing the top of the purse so the contents stay secure, I immediately thought of a backpack closure (it could be done with seam tape instead of sewing). Add enough extra fabric at the top of the purse to make a casing for a sliding backpack string and lock. It would take an extra second to open and close, but nothing would fall out. On the pocket, another idea would be to use a tea cup shaped piece of fabric (bottom of fabric piece is the desired size of the pocket, sides of the fabric flare out to a very wide top edge). Make a casing at the top edge insert elastic (cut to the desired width of the pocket) through the casing and tack at either end. Then pin and sew the pocket to the lining. Does that make sense? I work better with visual aids. The pocket would have space inside and the elastic would keep the pocket closed. The elastic could be replaced by a small zipper or drawstring and lock. The pocket could also be gathered on top and bottom using a long rectangle of fabric. The bottom of the pocket would be gathered to the desired width of the pocket and sewn down to the purse lining giving even more "bloom" to the pocket. I think oversized Little Golden Books would be awesome as front and back of a messenger bag. The fabric would have to be heavier or backed with some heavier interfacing, but the bag would be delightful. And I'd suggest magnet strips for the purse closure, all the way across. Finally, YAY FROG AND TOAD!!!! 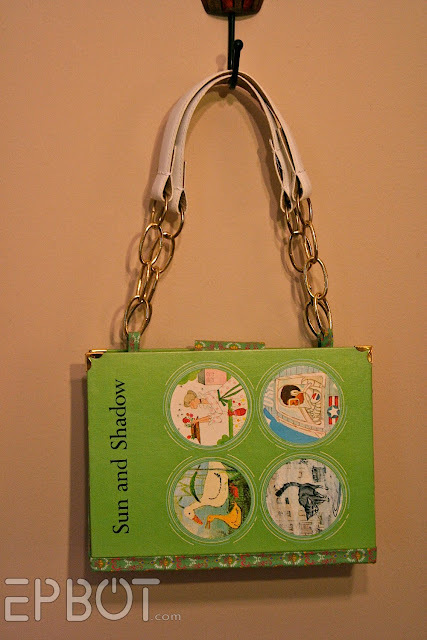 I am not a purse person but I love your book purses, especially since I am a book nut. Have you tried Aleene's Fabric Stiffener? I use it a lot with my leather masks. I love the idea about using tubing inside a cloth tube (hem tape minimizes the sewing). This isn't about purses or books. I saw a clip on NBC's The Voice a couple weeks ago about Dia Frampton's sister who makes robot jewelery. She made one with a cowboy hat for Blake Shelton. They were so cute and I thought of you, Jen. I think they said that she sells them online. Since you are the QUEEN of finding things online, I'm sure that you won't have a problem finding out more if you would like. I thought of you when I saw the cute robot jewelery, and so I thought I'd pass along the little info that I had about it. I don't know if this has been said before, but consider underlapping the fabric from the bottom of the purse under the book cover. if you still want a bit of trim covering the bottom of the book cover, underlap the fabric halfway, then reverse direction and peek a bit out to cover the bottom. by glueing the whole thing/attaching another way (that croc-a-dile hole-punching thing sounds awesome), you have the stability of the extra fabric without the pull on the cover. As far as pockets go, you need to measure the "pull" of the pocket, i.e. how far/big do you want extension/contents to be. take the size of the pocket when pressed plat (flat measurement) and add it to the extension measurement plus 1/4 inch (also add in however much fabric you will need to attach it to the purse in the end). Remember to mark the "ends" of the size of the pocket sans extension when you measure; you'll need it later. remember to add the 1/4 inch and extension measurement to 3 sides. the next part requires some sewing, but it's a whole lot easier than you think - just bear with me.) pinch the edge where you marked the boundary between the flat size and the extesion so you're folding the extension under the flat part. remember the extra 1/4 inch? that's the pinched part (1/8 inch on either fold) that you will sew (straight stich or whip stitch) through the fold to leave a tiny border on the boundary between the size of the pocket when flat and the extension zone. this will kep the pocket from "bulging out" in the purse unless the weight of the object inside the pocket is great. once you've sewed the boundaries (should be a big U with either curved or pointy sides depending on how you sewed it), you can attached it to the bag live you've already done. Tip: to keep the pockets flat when not in use, use the plastic folded strips like you did to keep the purse closing. take the strip and fold it in half long-ways (hotdog style! ), open again, then fold the corners like normal. attach to the pocket by simply glueing inside or "double" fabric to hide it inside. email me if you want pictures of what i'm talking about with the pockets (shushubear2005 AT gmail DOT com). OK, got through maybe 3/4s of the comments and still didn't see this suggestion...I like Fabri-Tac glue for all porous surfaces. I think they might be calling it Craft-Tac now. Just look for a clear bottle with blue and red writing. This is my go to glue--dries to the touch in about 30 seconds, so no interminable waiting for the glue to dry to move on to the next phase (I'm exceedingly impatient), it's completely clear, and it dries super-strong, flexible, and washable. An ealier commentor suggested using the book pages as part of the book construction which reminded me of THIS. A gown to go with the purse. 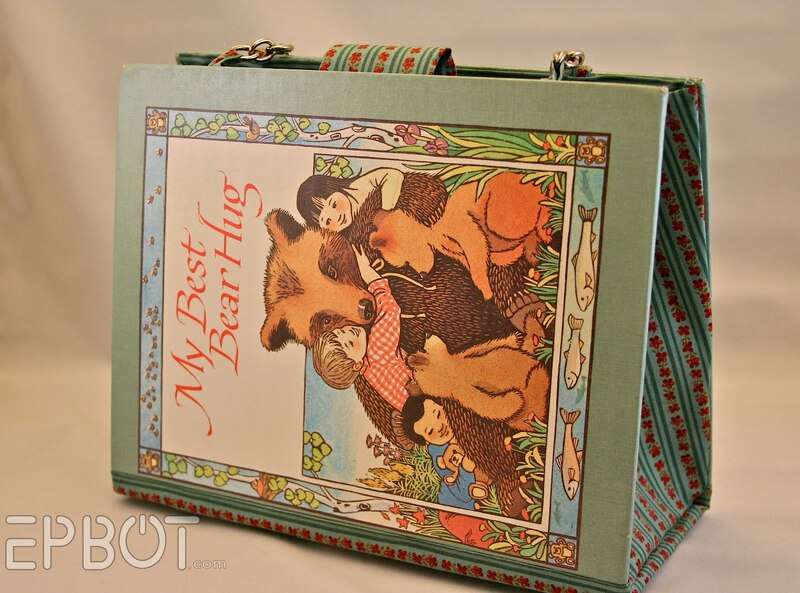 I think a Little Golden Book clutch would be the perfect accessory. Love your purses. As someone who starts and never finishes most projects, I think having so many finished purses is impressive. 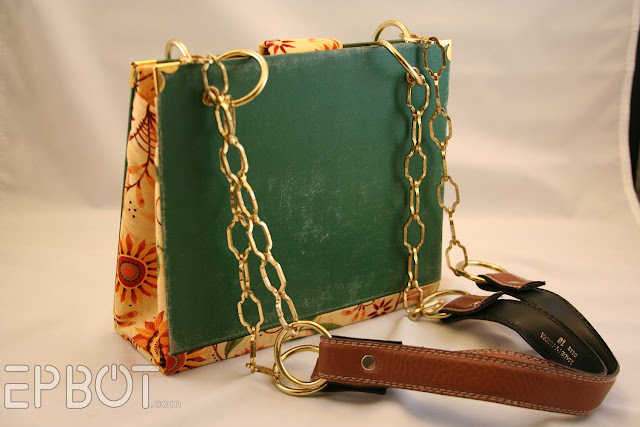 Have you considered making a messenger-bag style purse? That's what I use for my everyday purse. 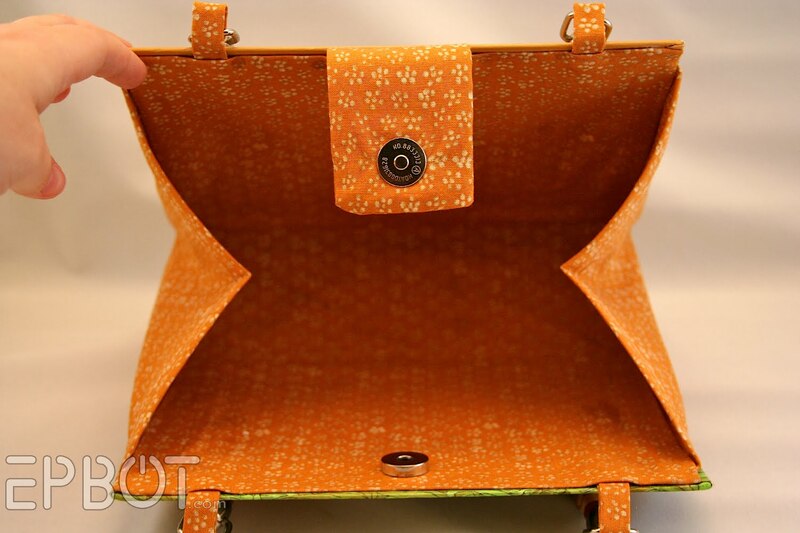 That would solve the problem of closing the top of the purse, while still allowing the purse to be any width. Make the front cover the front flap, magnet or snap close on stiffened fabric for front of purse, back cover is back of purse, soft fabric between front and back. It would also give you a good place to connect the handle. 2. Get a Crop-A-Dile Eyelet & Punch Kit. It's freaking awesome! 3. I'm stumped - other than somehow incorporating a zipper or using velcro...maybe a full-length flap of fabric on one side that uses multiple snaps to attach to the interior of the other side (thereby leaving the covers visible). Why not use upholstery tacks to attach the fabric to the books. Put the book cover on a piece of styrofoam. pound the tack thru the fabric into the book cover. Pull the book cover off the styrofoam & bend the pointy part of the tack flat. Cover the bent tack with a piece of duct tape. (to prevent the point from piercing your purse interior. Since you cover the inside of the book cover (as your purse lining) you will never see the tack. I love these -- and now I am going to have to find books I don't mind taking apart so I can make them. ;) I will suggest a way to make the pocket on the inside -- you will want a think elastic and a longer rectangle of fabric. Pleat the bottom part 2 or 3 times, run the elastic through the top edge, and when you sew it down it will hold things and not let them fall out! ;)I'm not so great at the description, but hopefully you can visualize what I am talking about. 1) Don't have any suggestions since I've never tried something like this before. 2) I want to try something like this now. Going used book shopping today. 3) If you ever get tired of them, I'd like to put a future bid in on one of the purses. Kinda off the topic, but still a bit related - I just found this awesome idea that you could use all the book spines for. Sorry I don't have any practical advice for your book bags. They're fantastic though! Whew, almost 100 comments. I don't have time to read through them all and see if the solution I thought of came up from someone else but I am thinking a product similar to hem tape called Heat N Bond would work. PLace between the book cover and the fabric and iron to create a seal. Loved the frog and toad purse! Those are gorgeous. When you perfect them, would you be willing to do a step by step tutorial? john... you're rockin' that knowledge book! Another vote for Fabri-tac by Beacon Adhesives. I've used it on everything. It was brought to my attention years ago by the seamstress who was making my wedding dress. I've always had a bottle sitting around ever since. Love it! I was a book mender for four years in college, so yes! I can help! The glue answer is PVA, poly-vinyl acetate, and is sold for book making. It's strong yet flexible, and is specifically used to hold fabric and paper together in books. The spine attachment is trickier: what we did when replacing spines on books (yeah, university libraries need lots of these) was this: with a sharp scalpel (xacto) slice the cover on the board about 1/8" in from the groove 'twixt spine and board. Then use a metal spatula (ours were medical lab type ones, a small palate knife type tool would work) lift the fabric off,removing the spine cloth. Then lift the remaining cover side about 1/2" in (this is easier with fabric than paper covers, if you can get under a layer of the board paper and lift it might prevent tearing). I'll skip the tissue-hinge and spine-replacement making, since you aren't keeping a text block or labeling it. Now take your new spine/fabric/purse bottom, glue up the area where you lifted the cover, and put the fabric of spine-area stuff down, the glue again and press lifted cover over new spine fabric. Press it down with a bone folder (or similar smooth pressing hand tool, plastic scissor handles work), if possible press flat while it dries (make sure no glue leaks out and sticks to the pressing materials). I have more to offer, but this is a long post. Write me if you want more! maddydumont (at) comcast dot net. Going to have to agree with the E6000. Toxic and amazing as so many epoxies are. I must also agree with the magnet thing. I am lazy and zippers annoy me. You can actually carve out a spot for the little magnets in the back of your book cover to set them in and then cover them with fabric if they are strong enough. I didn't see that anyone mentioned Tyvek. I recently started to make books and I use Tyvek, literally the stuff they wrap houses in, for spine support. Virtually impossible to tear and flexible as paper AND it can totally be painted with acrylics!!! You can also bind it to paper or fabric for bonus points. Have a great weekend and good luck with the beavers/ice hockey/maple leaf thing. If you use a clutch purse clasp, one of those metal frame ones that have the knobby things that click close, it should keep your stuff in. I know it's pretty much totally in left field, but my first thought for the closure/strain/one strap dilemma was to switch it up completely and make it messenger bag style. Obviously it would be a lot smaller, but if the front flap was the book cover (and the back panel could be the back cover I suppose) then it wouldn't have as much strain on it so that might solve the glue problem. Also, then the actual bag could be made of fabric (or maybe some durable corduroy like my favorite bag?) and you could add pockets for durability. Also, then you could add the single strap to the sides. I have no idea if this would work, but what about iron-on interfacing? I'm not sure what that would do the covers, but it would mean a free-standing bottom and no ugly joins at the bottom...just the possibility that the cover may start to peel away at the bottom at some point. It's worth a shot at least. Could You make a Harry Potter Book Purse? 1. Where the inner lining pulls up on the top corners: If they're loose enough, try attaching the fold over corner protectors over both the book cover and the fabric lining. 2. I remember that you have mentioned that you like to swap out art and this just kind of jumped into my head. I'm not sure exactly how to do it, but I think you could work it out: Use a fabric that matches a couple different book covers to create the purse body with clear vinyl side "pockets" where the book cover would be. I think this would make it easier to get the purse design you want and also makes it so that the book cover could be swapped out as desired. LOL the flexing makes it more manly because it's the book of Knowledge! And everyone knows Knowledge is Power! As far as one strap, I don't know. Usually the purses I carry that have one large strap have them attached to the sides, which doesn't seem like it would work because it would damage the fabric on the fold and it wouldn't carry right. Another idea that I've seen is to have two large straps, one a TEENSY bit shorter than the other so it can go underneath it and they double over like two straps. I've a purse like that and I adore it. Stitching is a good idea, and like some of the previous ideas have said, pre-hole the material and stitch with a VERY strong material. Vinyl, waxed thread, or a strong leather might work well for it, and you could match the color or contrast it. Good luck! I imagine a simpler assembly by taking fabric to make the entire purse itself, meaning it is a traditional fabric purse of sorts, and then attaching the front and back covers to the bag via glue, maybe rivets. 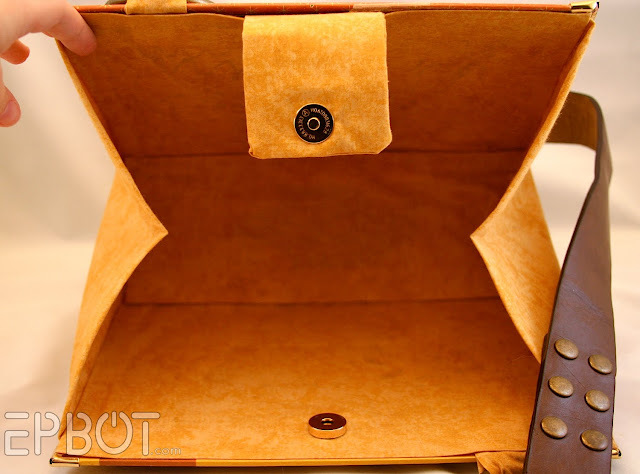 It would give greater freedom over the structural issues of the bag, be it attaching a zipper on the top to close it, or simply being able to sew the entire thing first and then adding the stiff cardboard elements. For a closure, how about folding the lining fabric (that was cut 1" longer on each long edge) over by 0.5", and gluing/sewing/ironing with hem tape down, leaving a narrow tube lining on each long edge. Then you can put a strip of bar magnet in each, the length of the purse. (But make sure to align them properly so when they come together they grab). That way the purse actually closes, but is easy for you to open. (Small fabric or ribbon tab on each side you can pull apart). Leathercrafter cement. You can get it through Tandy Leather or some craft stores, it works as well as barge cement, and it's not toxic. Also, dremeling holes through the covers before sewing will make your life 6 bajillion times happier. These are so cool! Not a clue about your glue issue but how about a toggle closure? Are you selling these on Etsy? Somewhere else? Please do! I would like a Harry Potter, please. Or maybe The Hobbit. I just wanted to second the recommendation for Sobo glue. It's great for mending book bindings because it dries slightly flexible and holds better than similar glues from the craft store. 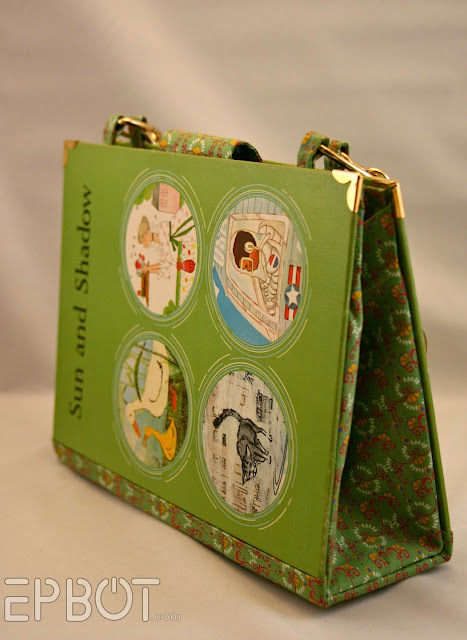 I once made a book purse decades ago as a gift, so I can't show pictures. The approach is radically different to yours, but without any sewing at all, so I thought I share it. I glued the whole thing together with double-faced adhesive tape left from our roof isolation - very sturdy, waterproof and will not ever come off again (german stuff called Isover). I replaced the spine and reinforced the sides with the sturdy black plastic foil that is used for lining ponds (Can't find the english word, sorry - I needed it waterproof). I used the pattern for paper bags - sides and front one piece, with extra pieces overlapping to the back and "spine" for glueing. I made it larger than the book cover. The front and back side doubled over ~ 2 inches and glued together over a slim metal rod for extra strength at the top. Then I took fabric and constructed the lining centered from the inside bottom, all sides elongated to cover the outside too, meeting on the outside bottom forming an x.
I couldn't sew (or handle drippy liquid glue) back then, so I used ironing hem tape, figuring the plastic would take all the weight anyway. All seams on the inside fit the inside perfectly, the outside seams were relocated to be hidden by the book covers ... ironing the last open side was a real pain! The plastic bag was then inserted into the lining from the (still open) outside bottom. Since now the bottom was the weak point, I had to use the straps for reinforcement. I took an old lunge line and riveted one end on the inside of the front near the side, keeping the carabiner inside. The rivet was sitting just beneath the metal rod passing 2 times through the leather. The strap went outside all the way around and was riveted on the back opposite to the first rivet, then crossed over to the other side (keeping the excess leather for a handle, because I needed the carabiner on the other end). The process was repeated on the other side. I cut the leather near the front and riveted an old belt buckle on both ends to vary the length of the strap, and D-rings on the leather opposite the carabiners to close the bag (using small pieces of spare leather). Since I didn't like the bottom now, I riveted a piece of leather on the bottom, the rivets serving as feet. Last, I glued the book covers on front and back using tape. I never made inside pockets since my friend uses a pocket organizer anyway... and she still uses the bag, so the tape adhesive seems to be good. yes you need a cropadile, they actually make an even larger one than the cropadile, I can't believe you don't own one already, you will not be dissapointed and it will be an asset to your too arsenal. But for the handles, how about looping them under the book covers and across the "spine"? Kinda like this one: http://t1.gstatic.com/images?q=tbn:ANd9GcRrzsNpTXNGXNlrcXxKOeTFlaJEZmt8J7EB06TtzHJR7UowjRQ5Og but without (or with) the metal pieces. You could use leather or fabric for that. Might even be able to eliminate the stiff spine. Instead of a zipper, how abot a drawstring closure? Would require some sewing, but I'm sure John's up to it. And while I'm at it, I'll add another vote for the messenger bag style. In order to get around the problem of securely attaching the fabric to the spine, I am punching holes on the bottom and sides of what will be the purse-covers. I intend to make the new "spine out of plastic/masonite layers as suggested, but I'll be able to rivet the spine and sides directly to the covers. The rivets should give it a pretty sweet look, too. In reference to the above comment, there is also a fabric Mod Podge that might help. i know you wrote that sewing is something you are not especially good at (although i have a hard time believing that, seeing how you are so talented with almost every other craft), but i agree with everybody that said: make a purse or messenger bag where you just attach the book covers to the bag without them having to hold the weight of your bag's content. or use old car seat belts. wow! how did i miss this post originally?! or if i did see it, forget that i saw it? coz this is exactly what i've been wanting to do. gah! anyway, the reason for my comment is that i am trying to make a cute version of the book cover bag and no clue how to go about it. i'm terrible at making things from scratch unless i have step by step guides or a drawing to go by. anyhoo, my idea is a handbag that is made from gorgeous material in a burnt orange type colour or what ever takes my fancy at the time but have PLASTIC POCKETS on the outside bag so the book covers can be interchangeable!!!!!! just 'unzip' the plastic pocket on the side, slide out cover and slide in new cover and rezip! this means that one bag can have a zillion different looks if the pockets were made large enough for different sized covers, but would also be spill/rain proof. i had a book cover handbag that got drenched in a downpour. i tried so hard to keep it dry but partially failed and it warped on me. :-( and having everything lost to flooding, i'm a big fan of the waterproof thing. anyone know how i may go about it? Have you tried decoupage glue for the fabric? e.g. Mod Podge? I have stitched through some pretty thick materials and my best tip is to use a pair of pliers. It´s still hard and time-consuming work, but easier on your hands. For the single strap idea. I'd put a large grommet and ring in the folded part of the purse? maybe that would pull it out too much? I also wondered if you cut the belt in half, attach the cut side to the purse (as you did), but then used the belt buckle & latch portion as a way to adjust the straps as needed & provide a decorative accent? I think creating a purse that the book cover slides into would end up being cheesy and not have the organic feel of the book purses you already created. I like the Tyvek idea for the spine for reinforcement, bonus is that it is weather resistant and you can glue or sew fabric to it easy-peasy. And I 2nd the idea for PVA - the adhesive bookbinders use. It is pretty tough. I'm an antique book collector and spent many years mending books in a library. Another good binding item is linen tape which you can get in practically any color to match the purse and use it to reinforce the connections between cover and spine. Use stitchery on top of it if you feel the need or desire - but it holds up pretty well. Have you tried liquid nails or construction adhesive? We built an upholstered tile headboard and it managed to attach fabric covered squares to spray painted plywood. What about a sort of mini messenger bag, where the book spine is at the TOP of the purse? A great glue is E6000 it is like the mother of all craft glue! Also in response to the closure I have seen some put the magnet closure on the outside of one side of the book with a fabric piece that has the other piece of the magnet so it closes in the outside. You could make the fold over piece the length of the book with a magnet closure on each end. I have also seen some that used a closure like the old school coin purses with the ball on top. They were either sewn into the lining or glued I am not sure which. I love the purses! I like the leather belt handle, myself. Dumb question: what are the brass rivet looking fasteners called & how did you put them on? Grommets? I have the best adhesive in the world. Sail makers double sided tape. I've used it on game board purses that I made. I love your idea of the spine being wider. Have you tried buckram, a very stiff cotton mesh instead of plastic. One advantage to the buckram is that you can use iron on webbing on it and then to the fabric. It keeps everything smooth. You can also sew it if you'd like. The pocket on the inside is funny. I did the same thing the first time. I hope the sail makers tpe works well for you.